During April 1 to 4, 2018, Dr.Sopon Pornchokchai, President, Agency for Real Estate Affairs (www.area.co.th) as the Director, Thai Real Estate Business School (www.trebs.ac.th) organized a class of AP140: Valuing Complex Properties, Batch 2 at the Thai Real Estate Business School. Thanks to all 20 participants for joining from Cambodia, India, Indonesia, Japan, Malaysia, Sri Lanka and Thailand. 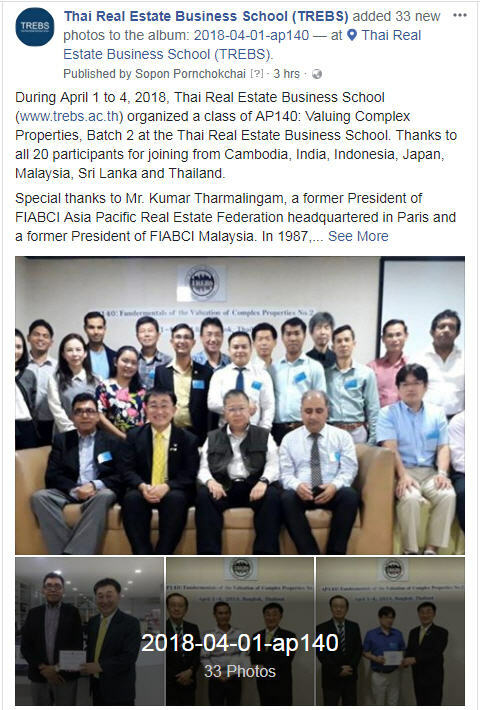 Special thanks to Mr. Kumar Tharmalingam, a former President of FIABCI Asia Pacific Real Estate Federation headquartered in Paris and a former President of FIABCI Malaysia. In 1987, he established First Malaysian Property Trust (FMPT). He is a Fellow of the Royal Institution of Chartered Surveyors (RICS) and the Institution of Surveyors Malaysia (ISM). He is registered as a Real Estate Valuer and Property Consultant with the Board of Valuers in Malaysia. He graduated from the College of Estate Management, London School of Economics with a B.Sc. in Real Estate from the University of London. Our participants all have had extensive experience in real estate. Therefore, this AP140 is a good forum for them to have some exchange of ideas on how to valuing complex properties. The Thai Real Estate Business School has successfully organized this second batch. We will organize another class soon. Many of our participants will recommend friends and colleagues to join our class too.